This guest blog post is by Greg Whelan, analyst, on behalf of The Linux Foundation. We thank The Linux Foundation for being a sponsor. The Open Networking Foundation (ONF) has recently released its road map for an end-to-end, programmable networking platform based on open source software. Called the Open Innovation Pipeline, it is a strategy to disaggregate traditional proprietary network devices in favor of ‘mix and match’ solutions built on open source SDN and NFV platforms. Solutions will come from multiple vendors and can integrate new technologies and innovations quickly to create a flexible and ultra-efficient infrastructure. The ONF is merging with On.Lab’s open source CORD® (Central Office Re-architected as a Datacenter) and ONOS® (Open Network Operating System) projects. Together they’ll provide the foundation for the Open Innovation Pipeline. The goal of the pipeline “is for the network to become easily programmed and customized, thus transforming it into a strategic asset as an agile platform for innovation,” said ONF Executive Director Guru Parulkar. ONF will discuss the Open Innovation Pipeline in more detail at Open Networking Summit 2017, April 3-6 in Santa Clara, CA. Packet Pushers readers can register now with code PKTPUSHERS15 for 15% off the attendee registration. The key word here is innovation. Traditional service providers (Telco, Cable, and Mobile) are striving to become more innovative to compete with aggressive, cash-rich, cloud-based competitors. These competitors offer a “good enough” service in weeks compared to the traditional service provider model of introducing a bulletproof “five nines” solution in 12 to 24 months. The reasons for this discrepancy are technical, commercial, and regulatory. A big difference is that while both the cloud companies and service providers own and operate modern data centers, service providers also operate complex, geographically dispersed networks, including the most challenging aspect of any network: the last mile. 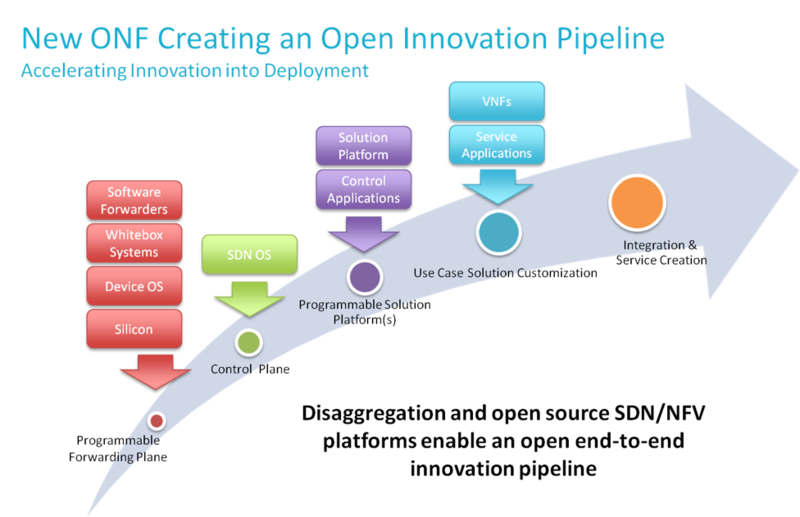 ONF, home of the OpenFlow standard as well as the CORD and ONOS open source projects, has introduced the Open Innovation Pipeline to disaggregate networking solutions. 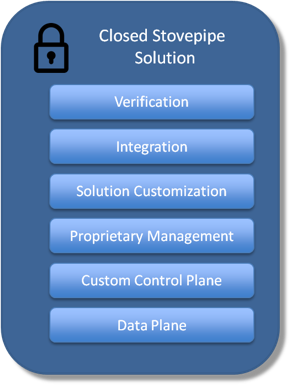 Traditionally, carrier-grade solutions are provided by a single vendor with a closed proprietary solution, referred to by ONF as a “stovepipe” solution (see Figure 1, below). A good example of this is the Optical Line Terminal (OLT) in the R-CORD case. An OLT is the Central Office System that terminates the optical fibers connecting homes and businesses in the serving area. Today, a single vendor provides the chassis, all the line cards (Access, Metro, Management), and all the operating and management software. These closed systems also represent a significant custom back office integration effort, unique management procedures, and equipment sparing challenges. These operational challenges have lead to the so-called “vendor lock-in” that service providers are seeking to eliminate. Simply put, in today’s stovepipe environment the costs and complexities of deploying a proprietary system are so high that adding a new vendor or changing vendors will only occur when the high bar of a public company’s financial models of the service provider are met. ONF seeks to change this rigid environment to one in which service providers, and enterprises, have the ability to mix and match solutions from multiple vendors and integrate new technologies and innovations quickly to create a flexible and ultra-efficient infrastructure. Their answer is the Open Innovation Pipeline shown in Figure 2. The concept is each segment of the pipeline is open to innovation and can be independently sourced from multiple vendors, which will all work together. This approach offers network operators many advantages. The primary one is to accelerate innovation and reduce the time to introduce new services to better compete with the cloud companies. By opening up “the programmable network” to the global open source developer community, service providers should have more choices for more innovative solutions. This could also create an enormous ecosystem of independent software vendors (ISVs). With this new model, service providers should be able to rapidly address emerging applications such as 5G and IoT and deliver solutions that meet their business and consumer customers’ needs. We’ve seen disaggregation before. In the early days of computing, companies would buy their hardware, operating system, application software, and support services from a single vendor. The PC changed this dynamic and created a wave of innovation that benefited the entire industry. Consumers and enterprises could choose from a variety of hardware and software vendors, which helped drive down costs, spurred innovation, and created ecosystems of software developers and integrators. A similar phenomenon occurred in smartphones. You have the closed ecosystem of Apple versus the “open” ecosystem of Android. (Android is owned and controlled by Google just as Microsoft owned and controlled DOS and Windows.) Yet, both Apple and Android have created an enormous ecosystem of ISVs as well. One issue that arises with the proposed pipeline approach is the ability for the service provider to qualify each component and then integrate it into a production network environment. Instead of acquiring a single stovepipe system, a provider using the pipeline model would have to test, qualify, and deploy multiple solutions. This creates an opportunity for system integrators who can navigate the ecosystem and create ‘known good’ implementations of part or all of the pipeline. Disaggregating the communication ecosystem will, in the long run, give facilities-based network operators a platform to compete with the cloud companies. The challenge is migrating or transitioning from today’s closed environment to tomorrow’s open environment. Service providers are reluctant to rip and replace existing infrastructure and specifically infrastructure that’s not fully depreciated. The alternative “cap and grow” method makes sense with new services. Given the traditional costs and complexities of deploying a revenue-generating service, network operators will remain reluctant to make the move solely to support existing services. If it isn’t broken, why fix it? Vendors, with their scarce R&D funds, traditionally have to develop an array of standards and “table stakes” features that customers expect but add no competitive differentiation. In theory, a vendor can use open source source code to meet table-stakes requirements and invest the R&D savings into innovation and competitive differentiation. This is a good general use of open source, but it’s only part of the full value. Vendors can also contribute back to the open source community. This ensures an active and robust environment, helps improve the overall code, and generates even more ideas and innovation. In this way the entire community benefits. Innovation should be the rising tide that lifts the entire ecosystem. The Open Innovation Pipeline provides a framework and a road map that clarifies and defines the open networking model, which in itself can drive further innovation in every aspect of the open network. The new ONF is positioned to leverage its successes with OpenFlow and CORD/ONOS and ignite innovation in the most challenging part of the network: the last mile. Learn more about the new Open Innovation Pipeline from ONF at Open Networking Summit, April 3-6, 2017. Packet Pushers readers can register now with code PKTPUSHERS15 for 15% off the attendee registration.